Y’all. I feel like I’m totally cheating the party planning gods with this one, but it’s too much fun not to share. But with 31-cent custom party invitations, how could I not? I hope I won’t get struck by lighting or something. Hosting parties can get expensive, and invitations, especially for kid parties, are crazy expensive and something that will most likely be thrown away. And since my two kids have birthdays just over a month apart, and right before the holidays, I definitely look for ways to keep costs down. Besides, the less I spend on invitations, the more I have left for the actual party. So when I was planning my daughter’s first birthday (which was just immediate family and a couple of close friends), I came up with the idea of designing an invitation and having it printed at the drugstore one-hour photo. I didn’t think it would work. But after one misfire and a second try, I got success! Then, when planning my son’s party, I thought I’d go for it again. It’s such a great way to get a completely custom invitation for a great price. Each photo cost 20 cents, and then I got a box of ‘special occasion’ envelopes for less than $5 for 50. 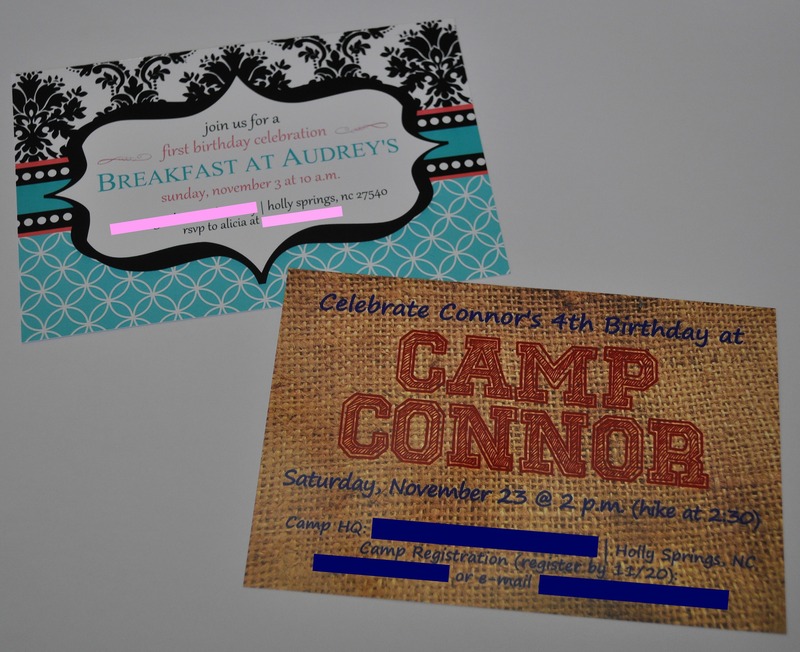 With tax included, I had a 31-cent, fully custom party invitation. For the designing part, I used Inkscape, a free design program that you can download. It’s not as robust and user-friendly as Adobe Illustrator (oh, how I miss it!) or Corel, but it works for simple stuff. But if you’re not familiar with design software, you can take any photo and print it. You can use photo editing sites like PicMonkey to add text and details and just send it off to be printed. What I love is that this can be so personal and be kept simple at the same time. How about a beach ball with the party details written on it for a pool party? Or your child holding a poster board with the information written on it? Or standing by a fire truck for a firefighter party? I just love how they turned out. And it’s such a cool and inexpensive way to set the tone for your next party. Do you think you’ll try it? This entry was posted in celebrations, diy and tagged custom invitations, diy invitations, party invitations, printed invitations on December 4, 2013 by aliciamariel. What a great idea! Might have to try this for my son’s birthday invites. Already thinking about that first birthday, huh? Let me know how it turns out! Yeah. Only because we are going home to NYC and trying to work out the logistics of planning from CA. Ugh.